I’m not a huge fan of Jamie Oliver’s recipe names style like “the best ___ ever”, “the ultimate ___”, and so on – taste is such a subjective thing, something fantastic for some people might not be all that for others. Make the streusel: in a medium bowl, mix together the flour, sugar, butter and cinnamon with your fingertips until the mixture is lumpy; refrigerate. In the bowl of an electric mixer fitted with the paddle attachment beat together the butter and sugar on medium-low speed until fluffy, 2-3 minutes. Add the egg and beat until completely incorporated. Add the banana mixture (it will look curdled, but that’s OK) and beat until combined. Reduce the mixer to its lowest speed and gradually add the flour mixture, beating just until incorporated. Spoon the batter into the prepared pan and smooth the surface with a rubber spatula. Sprinkle the streusel evenly over the batter. The cake is delicious and very, very moist – it will stay that way for 3-4 days if kept in an airtight container. I don't even like bananas and I have printed the recipe to make this. you make everything look so appetizing and beautiful! I too, am a Flo Baker Fan! Lynn, I hope you like it - let me know, sweetie! Annalise, thank you! I hope you like the recipe! Anna, LOL! Thank you, sweetie! Jennifurla, I wish I could share it with you! Thank you, dearie! Susan, you are far too kind, my dear! And Flo is wonderful, such an inspiration! Sweet and Savory Summer, I hope you make it! And let me know what you think, please? Anyone try doubling the recipe and using a 9 x 13 inch pan to bake? I have a large group to feed and no smaller pan to use. It does look wonderful! I love how doable all of Jamie's recipes are. I just made something banana too! Banana cream pie! this was very moist, but my struesel ended up sinking into the cake, any idea what i did wrong?? Clare, thank you! Banana cream pie - yum! Anonymous, I don't know what could have happened - how was your streusel's consistency before baking the cake? Peggy, I'm glad to hear it tasted great! But I wish the texture would have been OK for you. 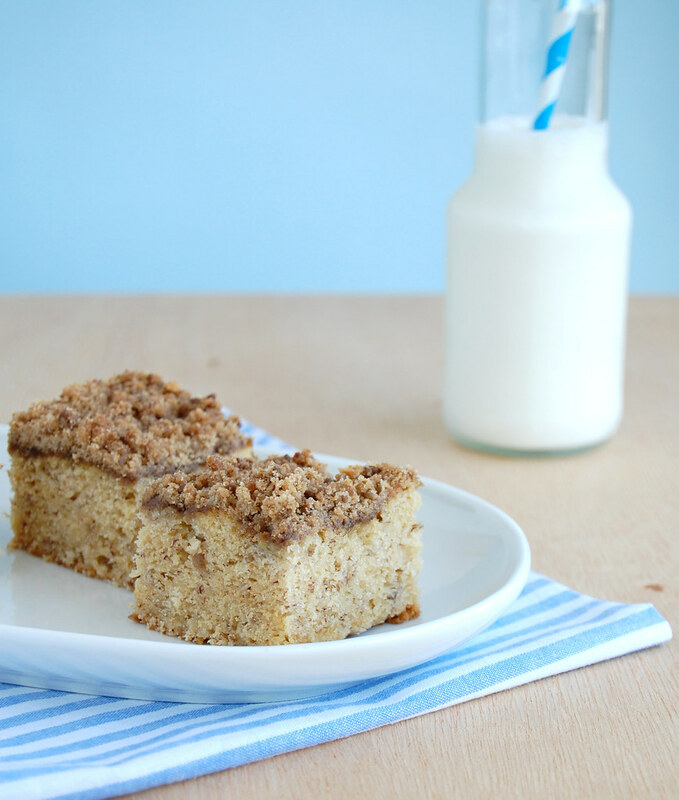 I have made ooodles of streusel cakes for breakfast before, but this one takes the cake. ha. literally. I made two modifications actually; added 2 small eggs, since I didn't have a large one, plus I added two heaping tablespoons of plain natural yoghurt to the banana mixture. The result was a very tender, moist, YUMMY banana streusel cake. I'm so glad to know you liked the recipe! Thank you for letting me know how it turned out! I made this the other day to take to a brunch and it turned out lovely. It was moist and fluffier than most banana breads and the streusel adds a nice crunch and sweetness.Everyone loved it, even my boyfriend who is not really fond of banana breads. I am going to blog about it and post you a link if you like. Hey, there - I'm glad to hear the recipe worked out fine for you, tks for letting me know! I made this cake today and I have to agree with your statement about it being THE best. The only change I made was to use buttermilk instead of whole milk. Hey, sweetie - I'm so glad to hear you liked the cake! I love the idea of using buttermilk in cakes.